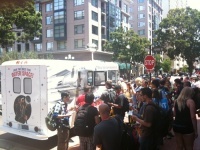 Super 8 was in attendance at SDCC, with a Poppeteers recruiting van handing out popsicles and swag. The Twitter account RocketPoppeteer became active, tweeting pictures and updates. Come get your Super Speedflier Fleet Popsicle! Come sing the Rocket Poppeteers theme song and get a special prize! Individuals with a letter from Rocket Poppeteers who show it to the truck crew would be given a 'special surprise' while supplies last. On the side of the truck are groups of ice cream flavors, with all but the first not yet available. This page was last modified on 26 July 2010, at 01:44.